Accessories: Accompanied by Cartier presentation box. The Crash is one of the most iconic Cartier wristwatches ever made. Its origins remain cloaked in mystery. While some claim that its form comes from a melted Maxi Baignoire Allongée, others declare that it was inspired by Salvador Dali’s Persistence of Memory. Regardless of its genesis, its importance and significance cannot be disputed. The curves, facets and sloping lines have today become synonymous with Cartier's design language. First launched in 1967 in Cartier London, the original yellow gold model has spawned variants, including gem-encrusted models to skeletonized versions. Made for the British market, the present watch is among the most coveted of all Crash variants. Displaying "London" on the dial, it is particularly beloved by collectors today. The case back displays London hallmarks for 1990, along with the maker's mark "JC" for Jacques Cartier, who was tasked with spearheading the London branch of Cartier. It is preserved in excellent condition with sharp and deep numbers on the case back. With the Constitution of 1848 came a new standard for luxury in France. Founded one year prior by Louis-Francois Cartier, the house of Cartier was one of the first to use platinum in jewelry making. This incredibly expensive material became the stepping-stone for Cartier to experiment in form, mechanisms and attitude. 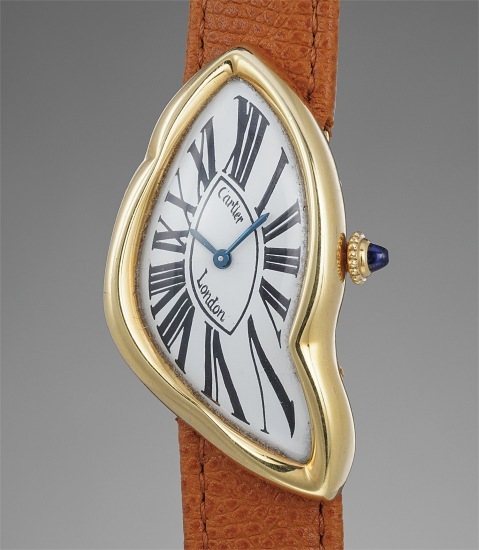 It helped men move from pocket watches to wristwatches, effectively making the watch much more functional and prominent in a man's overall wardrobe. Cartier did not only touch on functionality. Inspired by a commissioned painting by George Barbier featuring a black panther at the feet of an elegantly bejeweled woman, Cartier began incorporating wild animals in his designs—most notably, Cartier Panthère rings, bangle bracelets and watches. Yet it wasn't until the late 1960s that the house of Cartier debuted their iconic yellow and rose gold LOVE collection, which includes the famous bracelet that only a special screwdriver can open.